Sleeps 8 with WiFi, ski area just one mile away. hot tub, washer/dryer No cleaning fee! The Brown Eyed Girl, 315 Yankee Girl Court, is a deluxe 1200 sq ft two bedroom loft condominium with views of the Hermosa Cliffs from the living room, deck and master bedroom. The combination of amenities and style makes The Brown Eyed Girl the most highly rated loft at Silverpick. This condo sleeps eight. The well appointed master bedroom has a king bed and a wall mounted flat screen TV. The second bedroom has a king as well and another flat screen mounted above the dresser. There is a queen sized pullout couch in the living room and another queen pullout in the open loft. Linens, blankets and pillows are all provided. The kitchen features granite counter tops and comes equipped with full sized appliances including a microwave, ice maker and dishwasher and is completely stocked with pots, pans and dinnerware. Coffee, coffee fixings, salt and pepper, dish soap and hand soap are stocked as well. Be sure to read the kitchen inventory list at the bottom of the page. Trash is removed daily. The living room features vintage ski posters, a 46 inch flat screen TV, a DVD player and a wood burning fireplace. There is free firewood stacked outside the entrance under the stairs. The master bath includes a granite top double vanity sink and shower. The second bathroom also has a granite top double vanity sink, a tub and a shower as well as a washer and dryer. Towels and amenities are freshened daily. 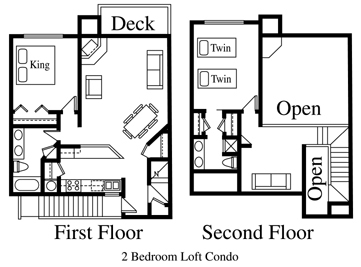 The Brown Eyed Girl is a clean, cozy and very popular condominium in which to pass a few days, weeks or months. It provides a range of convenience, views, and amenities that make it suitable for those who plan extended stays.